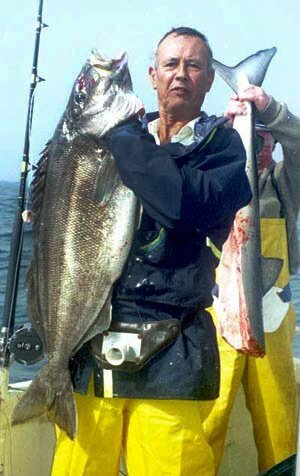 Canterbury angler Cliff Chishlom with a large trumpeter taken aboard the Reliance deep sea fishing over the Pegasus Canyon. This is more or less where you get to if you head east straight offshore from the North Canterbury coast and keep on going for 25 to 30 miles. 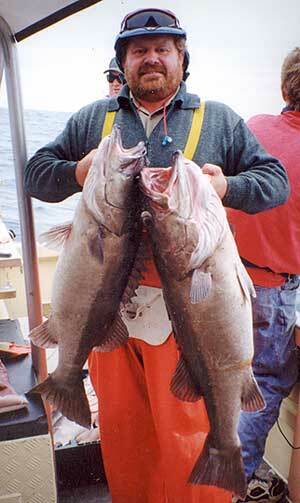 Out there you can catch groper, trumpeter, ling, blue cod, sea perch and sharks, as well as other species. Bottom bouncing in water over 100 metres deep requires specialist tackle to handle the heavy sinkers and potentially big fish being targeted. The great thing about fishing these distant offshore grounds is that you never know what you might catch. 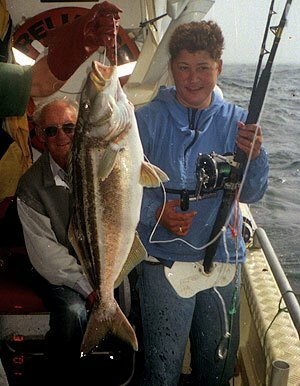 Nowadays almost all recreational fishing done over these deeper offshore grounds is done with a low-stretch braided super line such as Spectra. Monofilament is now almost a thing of the past for deep water fishing. With Spectra you can feel bites even at 100 metres whereas with mono the huge amount of stretch at this depth means that you are effectively fishing blind. You certainly don’t have to go all the way to the Pegasus Canyon to catch good sized blue cod, trumpeter, and sea perch. But it does help if you have GPS marks for the better offshore marks. I have been out to the Pegasus Canyon 30 odd miles off the Canterbury coast on a number of occasions. It can be a very long trip in a slow vessel travelling at 10 knots. At that speed, it takes many hours to get there. Over the years groups of anglers in their trailer boats have made the trip out to what is known as the “hole”. I have been out there in such boats several times in the past but would not do so again. I have also been out to the hole in large launches that travel at a good clip. These vessels have been skippered by experienced commercial fishermen who know what they are doing. This is much more fun. You can relax and enjoy the smooth ride. Groper like these beauties are the sort of fish available to deep-sea anglers fishing over the Pegasus Canyon when sea and weather conditions permit. The boat was the charter vessel Reliance. Whereas when skippering your own boat you have to be fully alert to the boat, sea and weather conditions. Prepared to make the decision to turn back at any moment should the situation dictate such action to be prudent. Often the sea can be flat calm for the first 12 miles or so. It then starts to get rougher the further out you get. Well out of sight of land in a small trailer boat is no place to be. Even with other boats present, much extra fuel aboard, radio, and such like, the margin for error is still perilously slim. When the sea is rough out there you can see your mate’s boat for just a few seconds every minute when you both crest the swell even though you are only 30 to 50m apart. Should your boat capsize 30 miles from shore, or a man be lost overboard lifejacket or not, in a rough sea, rescue is very unlikely. My advice is don’t go there in your trailer boat. 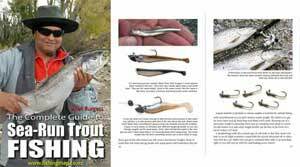 If you want to fish the Pegasus Canyon book a charter! Several larger commercial charter vessels have operated from Lyttelton in the past taking angling parties out to the hole for a fish. For economic reasons, these vessels have been unsuccessful over the long term. The reason being that too many days are lost due to bad weather. Most larger charter groups want to go for their trip on the weekend when they aren’t otherwise working. The trouble is that you can get bad weather for several weekends in succession totally disrupting angling plans. There are no islands to hide behind out over the Pegasus Canyon. It isn’t much fun fishing with rod and reel when you can’t stand upright! Another big trumpeter caught on our trip to the Pegasus Canyon. Poor weather aside the fishing can be excellent. Many believe that it may be possible to target broadbill swordfish off this coast. It really hasn’t been tried due to the lack of large suitable vessels and the aforementioned weather conditions. You really need to stay out for several days at a time. When wind and sea have been settled good catches of groper and trumpeter are often made. At 27 nautical miles, you start to reach the steep drop-off where the ocean floor descends many hundreds of metres. The goal is to fish the sides of this slope.